Niccolo De Masi is like the fairy godmother of mobile games. Whenever a star wants to create a virtual world, they seem to turn to him. As the CEO of game maker Glu (GLUU), he has helped A-listers like Kim Kardashian and Britney Spears launch mobile games around their personas. 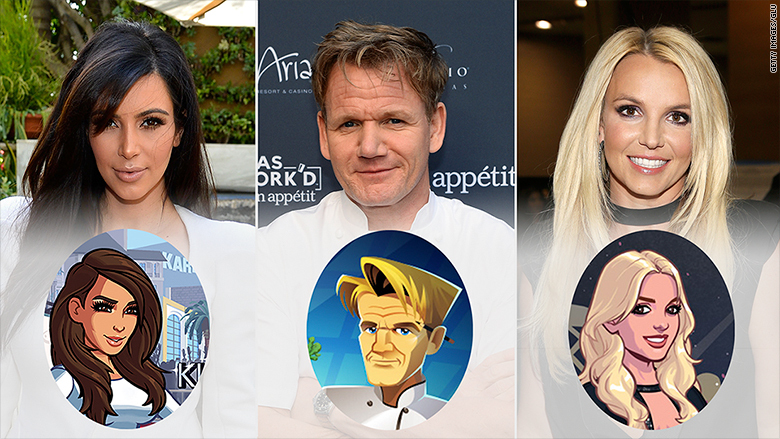 On Wednesday, celebrity chef Gordon Ramsay joined this growing list with his new game, Gordon Ramsay Dash. And later this year the company will release a new game for Taylor Swift. So how does Glu do it? "The trick to all of this is to be appropriate," De Masi told CNNMoney, meaning it's important to match stars with the right type of game. "We turn away most people because they don't have big enough of a brand or following," he said. Celebrities should have about 100 million followers on platforms like Twitter (TWTR) and Facebook (FB), for example. He and his company then analyze the fans. How fervently do they engage with the stars? Are the fan bases growing? Gaming is a way to monetize that social capital, says De Masi. But before entering into an agreement, he says he also looks for how collaborative someone is, how responsive they are, and how well they partner with the company. Some of the celebrities he's worked with have been more responsive than Glu's employees, he joked. And Ramsay was no exception. "Gordon is the most recognized chef in the world," said De Masi. "He's been very involved." Once the creative process gets going, the teams try to nail down the best type of game based on the fan base that they want to target. They start with categories that have proven to be popular -- such as racing, time management or a game that tells a story -- and match that to a star's existing business platform. Gordon Ramsay Dash, for example, is a timed skills game. Players have to make a certain amount of food for customers and collect tips within a short period of time. It's the latest in the "Dash" game series, which are all related to food. Gordon Ramsay Dash also mimics many of the high intensity competition shows that the chef is known for, including "Hell's Kitchen" and "MasterChef." Turning those concepts into a game is a way for fans to interact with Ramsay without having to wait for a show, says De Masi. 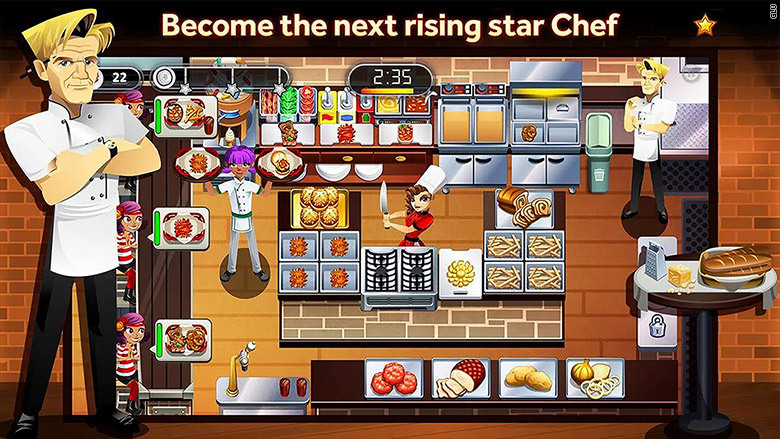 Gordon Ramsay's new mobile game puts players on a timer to make food for a busy cafe. The mobile gaming industry has fluctuated dramatically over the past decade. Developers have typically seen huge success with one game but then failed to find a competitive second act. Just look at companies like Rovio, maker of Angry Birds, and Zynga (ZNGA), maker of Farmville and Words with Friends. Glu has followed a similar pattern. Its stock price has fallen significantly from its peak, but big games have helped it to rise. Kim Kardashian: Hollywood, released two years ago, has been Glu's most successful game, with more than 45 million downloads and $158 million in sales. When it was released, the company's stock price spiked briefly. De Masi explains the challenge like this: Some industries, like financial services, face changes every decade. Mobile gaming faces them every year. Given that a new game takes about 18 months to develop and launch, the fluctuations are reflected in the markets. "The stock price moves with hits," he said. But it's also about making sure the games are authentic to their brand. Every detail has been carefully thought through, Gordon Ramsay told CNNMoney, from the wrinkles on his forehead and the pencil behind his ear, to his pose and Breitling watch. "This isn't a label slap," said Ramsay.